Kritters Thoughts: Molly is proposed to and finds out she is pregnant at the same moment and she has a lot of decisions to make. 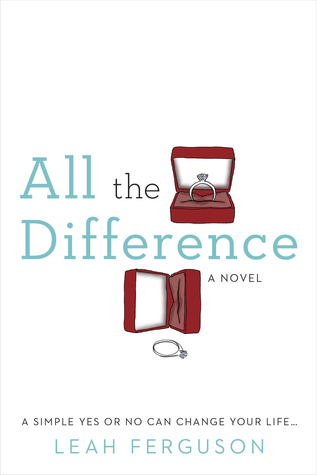 This book takes the reader down two paths, one where she says yes to the proposal and their relationship moves forward and the other chapters are if she were to turn down the proposal and decides to go the route alone. The chapters were easily labeled with a yes and no and each chapter moves the story along month to month, so as I started I was worried that I would miss seeing each month yes and each month no instead of every other and would not feel like the story was complete, BUT I was wrong! It worked so well. This book really made me think about the decisions I have made and not only how they impacted how my life would go, but how they impact those around me and even just the small decisions. I love when even a "light" book can make me think! As a side note - I love this type of book - the what if of life! If you have read this and liked it, stop what you are doing and go read Maybe in Another Life by Taylor Jenkins Reid. Disclosure of Material Connection: I received one copy of this book free of charge from Penguin RandomHouse. I was not required to write a positive review in exchange for receipt of the book; rather, the opinions expressed in this review are my own. I love it when books do that! I am really fascinated by these types of plots.